White Moss Thyme, also known as Creeping White Thyme, definitely lights up the area it is in. Its white flowers are about two inches tall and appear like little spikes all over the plant. It can be sheared after blooming or left alone. If left alone, the dead flower spikes will eventually fall off and the thyme continues to spread. The lively chartreuse mound of White Moss Thyme was planted in June from one of our little pots pictured on the left. It was planted in between flagstones that are placed about 8 inches apart. Three months later It had already reached 6 inches in diameter. The other thymes we like to use in between stepping stones are Annie Hall Thyme, Elfin Thyme, Highland Cream Thyme, Leprechaun Thyme, Mint Thyme, Pink Chintz Thyme, and Woolly Thyme. 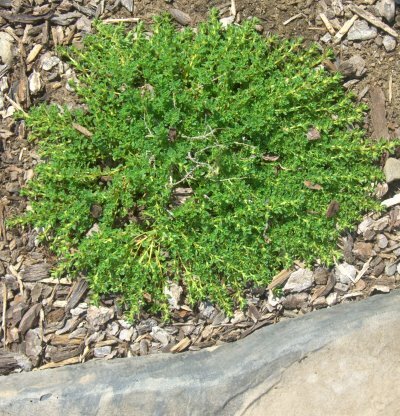 White Moss Thyme is often included in our economical Flagstone Filler Assortment. This plant is often available in plug trays. These trays hold 128 of all the same plant. They are a great low cost way to fill a lot of space. Each cell is 3/4 of inch by an inch. 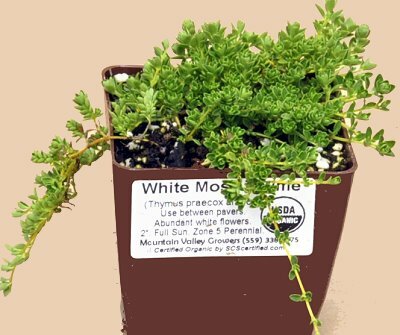 Check here to see if White Moss Thyme Plug Trays are available.